SPRING GRASS When the weather warms, asparagus starts popping up. In the title chapter of Stalking the Wild Asparagus, Euell Gibbons describes a fishing trip along the banks of the Rio Grande when he was 12 years old. On his way to the fishing hole, he was distracted. "Happening to look down," he writes, "I spied a clump of asparagus growing on the ditch bank, with half a dozen fat, little spears that were just the right size to be at their best." The thrill of spotting edibles in the wild is well known to foragers who make a practice, as Gibbons puts it, of "reaping where they didn't sow." To me, the sight of wild asparagus shoots poking out of the ground is akin to the spectacle of morel mushrooms on the forest floor. They remain all but invisible until you spot your first. Then, once you get your eyes adjusted to the shape—in both cases a stalk capped with a funky crown—they start materializing out of the landscape. Both wild and domestic asparagus are the same species, Asparagus officinalis, and harvesting cultivated asparagus is, like stalking wild asparagus, a magical experience. Although much easier to find than its wild counterpart, harvesting cultivated asparagus still involves a token hunt. Even in a farm field, the stalks remain all but invisible until the first one is spotted. Then more appear. I once joined a spring asparagus harvest at the farm of my friend Jane Kile, who has since passed away. 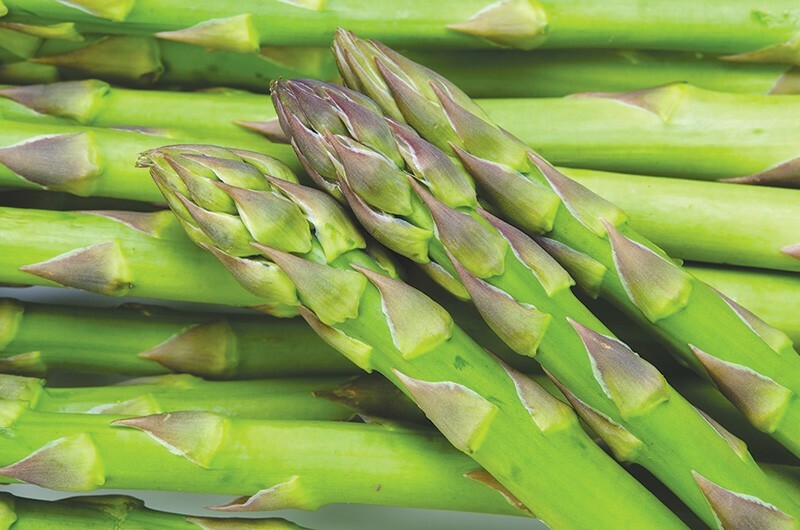 All of the previous year's mature plants had been removed from the asparagus patch in Dixon, Mont., leaving a brown field that appeared totally barren. But as I approached, I realized it was full of fast-growing stubble. "It will grow six inches in a day, if it's warm enough," Kile told me on that chilly April day. "But today it probably only grew a 10th of an inch." Although it's more closely related to grass, asparagus requires the long-term commitment of someone who plants an orchard of fruit trees. A good patch will produce for 20 years or more, but the asparagus grower must wait years before harvesting any shoots, giving time for the roots to establish themselves. After a five-week harvest, quit picking and let the shoots grow into plants, which can supply the roots with the necessary energy to make it through the winter. Here's Kile's recipe for asparagus soup. It will help you make it through the spring. And if you freeze enough, it will take you through summer too. Peel a head of garlic and oven-roast the cloves at 350 degrees until completely soft. Meanwhile, trim one and a half pounds of fresh asparagus by cutting off the woody sections at the thick end of the shoot. Break off the tips and cut the remaining stalks into one-inch pieces. Heat four tablespoons of butter in a pan, and sauté two chopped leeks until tender. Add the asparagus stalks, roasted garlic and enough chicken stock to cover them. Cook until stalks are tender. In another pan, boil the tips for five minutes. Allow the asparagus and garlic to cool, and purée it. Return the puréed mixture to the pan, add three more cups of stock and bring to a simmer. Remove from heat and season with salt and pepper. Add the boiled tips, and stir in three tablespoons of lemon juice.